Charlie McGowan in action for the England Counties XV. WORTHING Raiders Rugby Club were well represented on the international stage at the weekend when they had five current or former players on England duty. Former talent Joe Marler was in action for the senior England team as they fell to their first Six Nations defeat, 19-9 to Ireland. Joe Marchant, who is currently on loan to Raiders from Harlequins, scored a try in a 19-14 win for England’s under-20 side in their Six Nations clash in Ireland. Two former Worthing players were also involved in that match as Piers O’Conor also touched down a try, while James Chisholm lined up alongside him. Raiders lock Charlie McGowan made his first appearance for England Counties on Friday as they secured a 37-3 victory over the Scotland Club XV in Flyde. McGowan was delighted to make his England Counties debut and said: “It has always been a dream of mine to represent the Counties XV and it was a great experience. “The first 20 minutes were really feisty but once the side settled down we ran away with it. “To run out in English colours was a fantastic feeling. “I had a lot of my family up there for the match and that makes it that much better when you look into the stand and see all of them. “That was my first appearance for the England Counties and, after that 80 minutes, it just makes you hungry for more. Raiders chairman David Hinchliffe was delighted to have so many former and current Raiders on the international stage. He said: “It was great to see a great Raiders representation for England over the course of the weekend. “We manage to dual register a great deal of players from Harlequins and other sides. “When they come to us, it provides them with the experience that they require. “This was the case with Joe Marler, James Chisholm and Joe Marchant this season. “We had Joe (Marler) come back to the club around 18 months ago and he said how beneficial his time was with us. “In the case of Piers O’Conor, he came to us having not been involved with an academy and since his move from us has gone on to flourish at club level and with the England under-20s. “Finally, it was great to see Charlie McGowan get the opportunity to play for the England Counties. “Charlie is a local lad and has been great for Raiders in his time with us. Raiders head coach Kieron Dawson was also in international action on Saturday as he was part of the Irelands legends squad, who took on England legends. 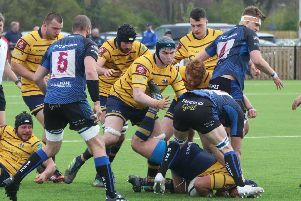 Raiders fell to their heaviest league defeat of the season, 29-10, at Bishop’s Stortford on Saturday. McGowan is hoping Worthing can finish the season strongly now and said: “I heard that Saturday’s game was not the best.